This series offers fresh approaches to teaching and learning by reviewing traditional methods in light of evidence-based strategies to promote practices that best facilitate student learning. Each volume of the series is written to provide early career faculty with specific strategies that can be quickly implemented, mid-career faculty with the opportunity to adapt and expand on what is currently used, and experienced faculty with new perspectives to augment thinking on foundational aspects of teaching and student learning. These succinct and practical books, by authors with extensive experience, are designed to address ubiquitous classroom challenges faced by faculty throughout higher education, whether contract or tenured, or teaching at two-year or research-one institutions. Is the lecture an outmoded teaching method that inhibits active learning or is it a potentially powerful tool that is an essential part of every teacher’s repertoire? This book presents up-to-date research on the different types of lecture, on what constitutes effective lecturing, and on the impact of lecturing when done appropriately and well. It fills the void in professional development resources on how to lecture, validating the practice when it’s aligned with the educational mission of creating engaged learning environments. Christine Harrington and Todd Zakrajsek demonstrate that, rather than lecture and active learning being mutually exclusive or either-or propositions, the effectiveness of the former can be greatly enhanced when combined with active learning techniques through what they define as dynamic lecturing; and provide context about the need to balance these approaches to meet the needs of students as they progress from novice to advanced learners. They present a range of strategies that enhance student learning during lectures. They open each chapter with the evidence behind each lecturing strategy they describe, and conclude with practical suggestions for quick application in the classroom. They offer readers the lecture planning and evaluation tools for reworking their lectures in ways that provide high-level engagement and achievement for their students. The opening section of the book explores the benefits of lecturing and describes the different modalities of lecture, with an assessment of the advantages and disadvantages of each. The second section focuses on educational strategies to enhance the lecture, including, among others, activating prior knowledge, emphasizing important points, effectively using multi-media, making concepts meaningful via examples, and the importance of retrieval practice. Each covers the underlying theory and research, and advice on how to align the engagement techniques with instructional goals. The book concludes with guidance on effective planning for lecturing and helping chairs, administrators, or peers engage in effective evaluation of the lecture. This is a dynamic resource for all faculty interested in revitalizing their teaching. The strategies are succinct, easy to incorporate into lectures and, done well, will have immediate impact and increase student mastery of course content. "This book is a valuable resource for college professors and teachers for stimulating the engagement and learning of their students. Harrington and Zakrajsek have put together an array of lecture techniques and strategies (supported by evidence-based research), and as such, they demonstrate how we can use lectures as an effective teaching tool for moving our students to be more interested in their own learning. All in all, this book is an excellent resource for our learner-centered classrooms where lecturing and active learning are combined." "This book is masterful in its ability to use modern research and thinking as a lens to inform an age-old method. As an advocate for inclusive teaching, it is wonderful to have a tool that honors this invaluable approach to instruction for both teachers and those they teach! I hope this book can help people who often use lecture as a last resort (like me), better embrace lecture for the powerful tool that it is." Student engagement has become such a dominant educational buzz word that it has almost become an educational end in itself—a learning outcome rather than what it really is—a learning process. Dynamic Lecturing could not come at a better time. It brings balance back to the pendulum by reminding us that student-centered activities should not be used to displace and replace the lecture, but to complement and augment it. This book meticulously documents how deep learning can and does occur when knowledgeable instructors share their knowledge with passion and enthusiasm, when they enliven academic content with meaningful personal stories, and when they model higher-level thinking skills for their students to emulate. The book provides solid research-based evidence for the power of lectures and extensive evidence-based practices for magnifying their power. That being said, this book is much more than a book about lecturing. It demonstrates how lectures can be incorporated into an effective instructional sequence and seamlessly integrated with student questioning, student writing, small-group work, educational technology, and student assessment. 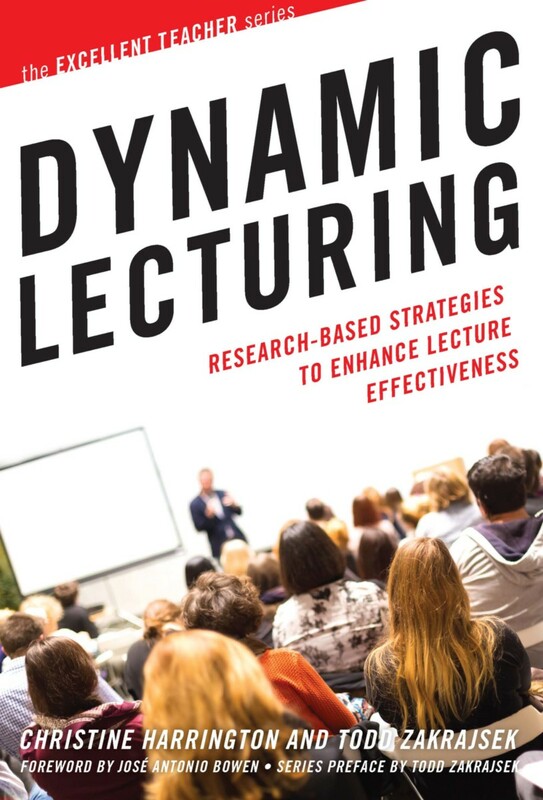 Dynamic Lecturing is really a book about effective college teaching. It will make a valuable contribution to the professional development of current and future faculty. "Finally, a book that lifts lecturing out of the land of ill-repute and positions it squarely in the midst of active learning strategies. Harriman and Zakrajsek present a plethora of simple strategies, based on numerous research studies, that will actively engage students in learning. This is a must read for faculty who want to use lecturing as a tool to improve students’ critical thinking and problem solving skills." "Headline news! Students can learn from lectures! This is Harrington and Zakrajsek’s convincing, evidence-based argument. Their book is the first one on lecturing since Bligh’s fifth edition of What’s the Use of Lectures? published back in 1998. Academia really needs Dynamic Lecturing, especially because the lecture is still the most popular teaching method around. So let’s stop trashing it and just do it well by 'accessorizing' it in some of the many low-effort ways Harrington and Zakrajsek recommend." Christine Harrington is serving a two-year term as the Executive Director of the New Jersey Center for Student Success at the New Jersey Council of County Colleges. At the conclusion of this term, she will return to her position of Professor of Psychology at Middlesex County College. Todd D. Zakrajsek is an Associate Professor in the Department of Family Medicine at UNC-Chapel Hill, and Executive Director of the Academy of Educators in the School of Medicine. Prior to his work in the School of Medicine, Dr. Zakrajsek was the Executive Director of the Center for Faculty Excellence at University of North Carolina at Chapel Hill. Before arriving at UNC, Dr. Zakrajsek was the Inaugural Director of the Faculty Center for Innovative Teaching at Central Michigan University and the founding Director of the Center for Teaching and Learning at Southern Oregon University, where he also taught in the psychology department as a tenured associate professor. Dr. Zakrajsek currently directs six Lilly Conferences on College and University Teaching and Learning and sits on two educationally related boards: ERI for Lenovo Computer and TEI for Microsoft. Dr. Zakrajsek received his Ph.D. in Industrial/Organizational Psychology from Ohio University. He holds positions on editorial boards for several journals and has both published and presented widely on the topic of student learning, including workshops and conference keynote addresses in 42 states and 6 countries. Watch Todd's TED Talk here.